The Procedure of Reduction of Share Capital of the Company. Such reduction shall be made if the company is not in default in the repayment of any deposits accepted by it or the interest payable thereon. · List of Creditor giving particulars with respect to name , address and amount outstanding duly certified by Managing Director or by two of the Directors as true & correct as on a date not earlier than 15 days prior to the date of application. · The copies of list of creditor must be kept at registered office for inspection by any person. Ø The Tribunal shall give directions for publication of notice in Form RSC-4, for seeking objection within 7 days in English and Vernacular Language Newspaper with circulation in the State of Registered Office ad Tribunal may direct to upload such notice on the website of the Company. Ø The Notice must state the amount of proposed reduction of Share Capital, place where the list of creditor be inspected and time within which objection to be given. 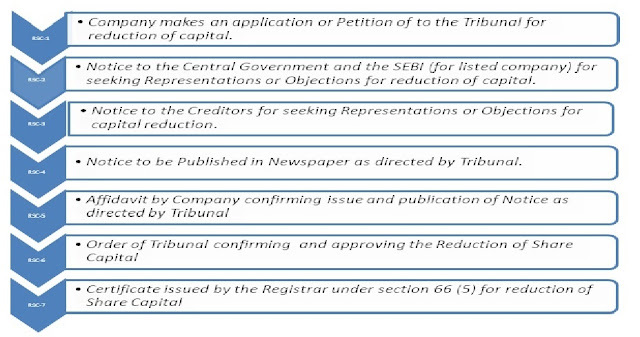 The Tribunal can fix the time maximum 3 months for filing of such objection from the date of publication. Ø The company or person so directed within 7 days from the date of issue of issue of notice give an affidavit in form RSC- 5 confirming to the tribunal dispatch & publication of notice. 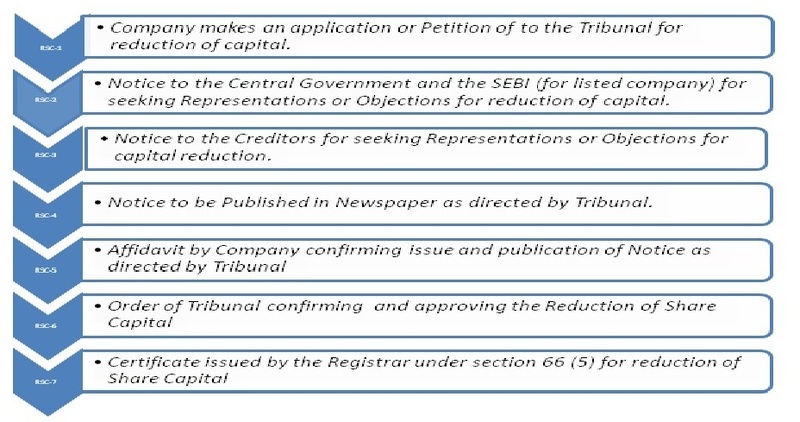 The representation or objection by any authorities or creditors of the company can be made within 3 months from date of receipt of such notice in case no such representation is received within such period by the Tribunal then it will be presumed that they have no objection to such reduction. The Company shall within 7 days of the expiry of the period up to which representations or objections were sought file its responses for such objections to the tribunal. Ø The Tribunal may issue an order confirming the reduction of share capital and approving the minute may include any terms and conditions as may deem fit in form RSC-6. Ø The Registrar may shall issue Certificate in form RSC-7 under Sec 66 (5). The provisions of Section 66 shall not be applicable to Buy-back of securities.